Welcome back to a new post on IBeautySpy! 😀 Today I will be reviewing a toner from an all natural brand called Artisanal Skincare. They have a very nice assortment of various natural products like cleansing powders, toners, serums, face masks, body scrubs and body oils. I ended up picking two of their products when they were on a 30% discount. One of them is this Artisanal Skincare Holy Basil Cleansing & Toning Water. Read on to know how it worked for me. Before that, let’s see a small introduction about the brand itself. There is something magical about the word ‘handmade’, isn’t it? It stands for uniqueness, personalisation, and discernment – all of which Artisanal Skincare embodies. Our range of skincare and wellness products are not only handmade, but limited edition as well. We produce them in small quantities and without any preservatives, in order to stay true to the inherent goodness of the ingredients. Our products are not traditional but come from tradition and from our belief that what you cannot eat should not be put on your skin. The oils, herbs, and spices that go into our creations are sourced from all over India – from Himachal to Kerala – with some even coming from across the oceans, which is why the end result is near perfect. Each eco-friendly, natural ingredient has neither preservatives nor chemicals – just pure, authentic skin care. Artisanal Skincare is the brainchild of Shivani and Akanksha. Shivani is a reiki practitioner and yoga teacher, and a lifelong believer that Mother Nature has answers to most things. Akanksha is an award winning wildlife filmmaker with a deep connect with nature and wilderness that only few people have. Our collective belief in the healing power of nature is what gave birth to Artisanal Skincare. To present traditional skincare recipes with a modern twist. We come from India but our sensibilities are of the world. Each magical mix is derived from our travels, and recipes passed down from our grandmothers. Take that, and our focus on the miracles of nature, and you have Artisanal Skincare. In fact, we are so committed to delivering nothing short of perfection that all our products have been tried and tested on our family and friends before being made commercially available. This also tells you that we do not test on animals. Free from preservatives, chemicals, and essences, and packaged in recycled plastic, we believe that nature delivers best when used without adulteration. Hence most our products are available in powdered form. This helped us to avoid preservatives, and increase the shelf life of the products. Apart from lasting longer, our products are in powder form for ease of travel and limiting spillage. Precise instructions on our back label also enable you to use the product accurately, without wastage. And that is the least we could do to contribute towards the environment. Welcome to the world of Artisanal Skincare. We thank you for using our products and hope you enjoy them as much as we loved creating them. Holy Basil (Tulsi) is well known for its anti bacterial properties. This toner is made with real tulsi leaves, distilled to form a cleanser & toner that will leave your skin feeling fresh. It will absorb excess oil from your face without drying out your skin. With its anti-bacterial and anti-microbial properties, it is perfect for people with acne prone skin. If your skin breaks out often, then this is a toner just for you. Artisanal Skincare Holy Basil Cleansing & Toning Water comes in a tinted plastic bottle. On opening you can find two dispensers, one small and another big, both covered by a cap. The packaging is simple but the design and logos of Artisanal Skincare are very nice. Gives a traditional feel to the products. 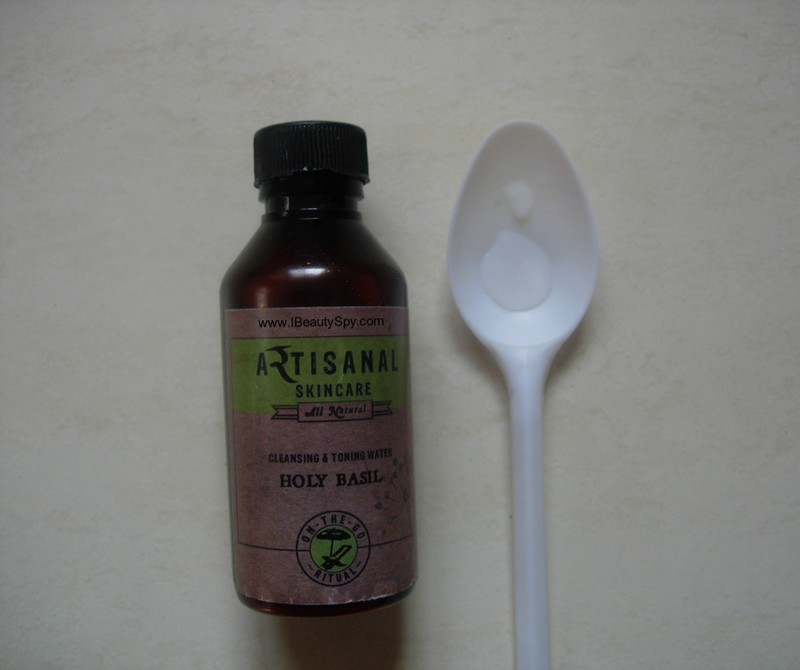 Artisanal Skincare Holy Basil Cleansing & Toning Water is colorless and looks just like water. It has a refreshing natural scent to it maybe due to the presence of alum. The scent is very mild and not bothering. I pour out few drops of Artisanal Skincare Holy Basil Cleansing & Toning Water on a cotton pad and dab my face with it. True to its name, it cleanses as well as tones skin. Any residue dirt and dust comes on the cotton and my face feels squeaky clean after using this. It also helps to control oil and mattifies skin. But still it doesn’t dry out skin. My skin feels in the perfect state – not oily but still hydrated. I have been using Artisanal Skincare Holy Basil Cleansing & Toning Water twice in a day – morning and night. With regular use, I can see my pores are minimized and face looks clearer. My breakouts have also reduced. I think this toner would be a great option for those with oily and combination skin. But other skin types can also use it as it doesn’t dry out skin. The toner is made from 100% natural ingredients. The main ingredient of this toner is holy basil. We know holy basil, also known as tulsi, is a great anti-bacterial and anti-fungal ingredient, making it ideal for acne-prone skin. It also helps to treat blemishes giving clearer skin. The toner also contains alum which is useful for acne treatment and also for tightening skin. Glycerin helps to retain the moisturize and doesn’t dry out skin. Simple and functional. No other harmful chemicals. * Acts as an additional deep cleansing step. * Leaves face squeaky clean. * Helps to control oil and mattifies skin. * Reduces breakouts and gives clearer skin. * Contains 100% natural ingredients. Its slightly pricey. But I think finding a distilled holy basil toner is rare. And the effects are good for the price. 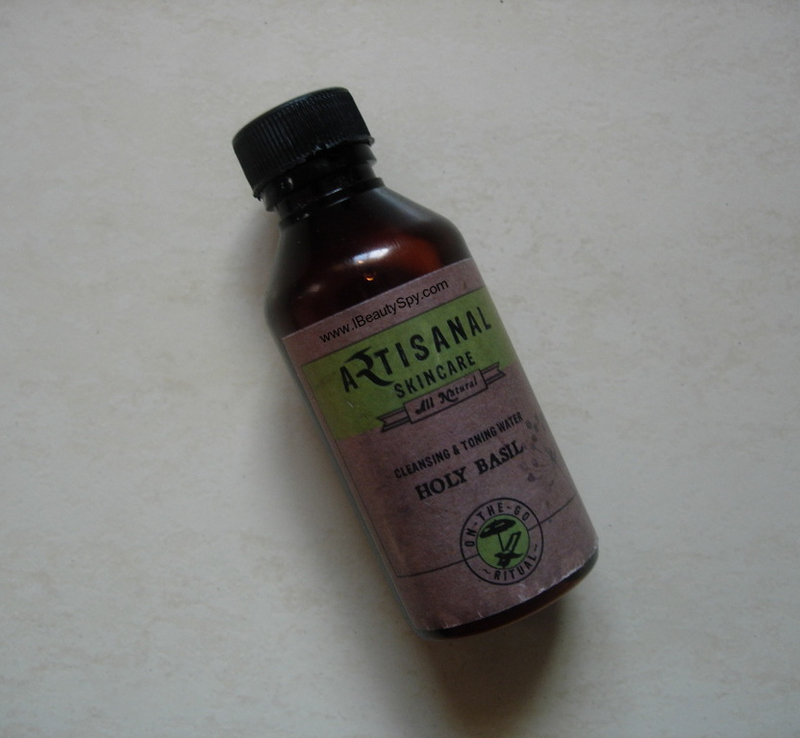 Artisanal Skincare Holy Basil Cleansing & Toning Water is a very good natural toner suitable for all skin types. 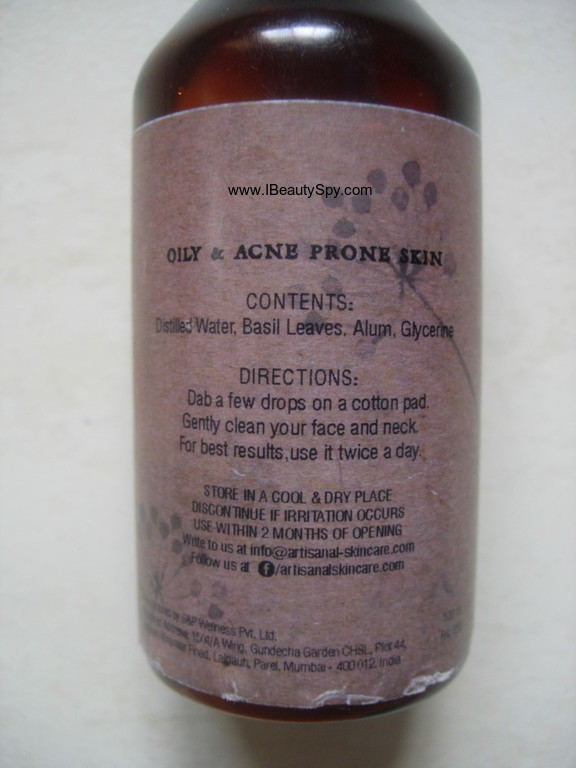 It contains distilled basil leaves and alum which are effective for oily and acne-prone treatment. If you love using natural, organic products, you will really love this toner. Do give this a try and let me know! Yes, anything with basil attracts me. I loved using it. Wow this really sounds good. I would love to try this after winter. Because I tend to skip toners in this season.